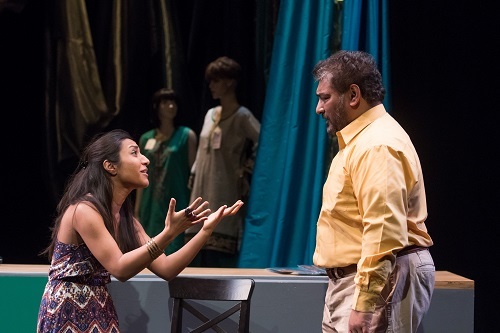 Anusree Roy’s new play Little Pretty and The Exceptional is currently premiering at the Factory Theatre. The play opens in the sari shop the family is about to launch. Yarrik Larivee’s set design is simple and realistic, adding depth, texture and colour to the atmosphere while forcing the action downstage. The story is ostensibly focusing on the future of this family: the grand opening of the store. But Roy’s play is about how the family needs to reckon with the ghosts of past trauma and the current reality of mental illness. The acting is strong across the board: Sugith Varughese as Dilpreet plays the role of an Indian father of two Canadian teenage girls with an excellent balance between being comic but not over the top: he depicts Dilpreet’s stereotypical mannerisms and patriarchal sensibility, but from an authentic place that is striking in its emotional resonance and humour. Shruti Kothari as Jasmeet is endearing and hilarious in her characterization, particularly in the ways that she punctuates her dialogue with interesting and amusing movements and mannerisms that add a dimension and depth to her character to such an extent that there were times that I forgot she was playing a role. Farah Merani as Simran is less strong, but with a much more difficult part. The narrative arc of Simran is kind of clunky and seems to happen fast. It’s hard to represent the development of mental illness on stage – small and incremental psychological shifts are often done better on film. In theatre, the risk is that the portrayal can end up being awkward or melodramatic, which is what happens in this production. Kathari as Jasmeet is centered in her body, but Merani less so, which doesn’t help the portrayal of her emotional and psychological decline. What isn’t clear to me is whether Simran’s character is dealing with mental illness full stop, or if she is reckoning with unresolved past trauma, or perhaps both, and if so then how are the two related? Is she sick because she’d inherited a disposition for mental illness from her mother? Or did her mother’s past actions inform the development of this trauma? These questions don’t necessarily need answers, but my worry is that the ambiguity is a function – at least in part – not of intention but of the awkwardness of portraying this kind of story in this kind of medium. Overall, the production is entertaining, emotionally touching, and enjoyable. We need more stories about immigrants and their families, and more stories about mental illness. Although this production doesn’t quite hit the target as precisely as it could, it’s aiming in the right direction.